Oscar Isaac sees 'Star Wars' villain Darth Vader as his own dad. 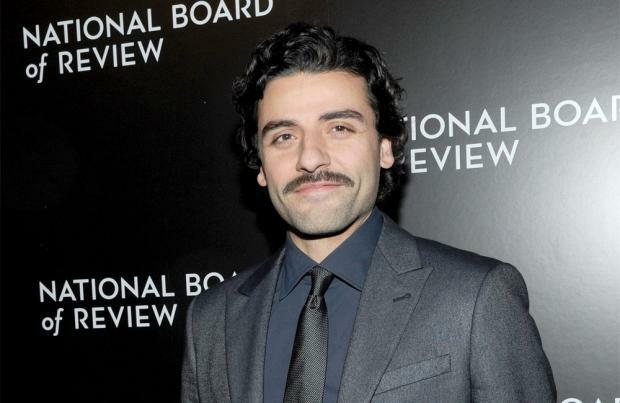 The 35-year-old actor recently finished shooting the hugely anticipated sequel in the saga, 'The Force Awakens', in which he plays Poe Dameron. Isaac's first memory of George Lucas' sci-fi series is watching 'Star Wars Episode VI: Return of the Jedi' in the cinema and the most powerful scene for him was when Luke Skywalker takes off his father Darth Vader's black mask to see his human face before he dies. The star admits it had a profound effect on him and many other film goers because the Sith Lord represents how we view of our own dads. In an interview with ShortList magazine, he said: "The first film I remember seeing in the movie theatre was 'Return of the Jedi'. I don't know if I had a favourite character, but I remember the scene where Darth Vader's helmet comes off being really intense for me. You don't even realise, but you see Darth Vader as your father. It's about father figures being these impenetrable figures and realising they're actually just vulnerable, frail human beings." Very little is known about the plot of the latest instalment - directed by J.J. Abrams - or Isaac's character. Isaac has revealed he and his castmates had to read their scripts in a room with cameras inside to prevent any leaks, but he accepts the interest surrounding the movie means special measures had to be taken. He said: "There was a special room with CCTV where you read the script. It's a wild world out there, where the hunger for even little titbits is ravenous. As soon as you're in, you're part of the world." Isaac appears in 'Star Wars: The Force Awakens' with John Boyega, Daisy Ridley, Adam Driver, Andy Serkis, Mark Hamil, Harrison Ford and Carrie Fisher. He can next be seen in 'Ex Machina'.